Este recorrido por la zona desmilitarizada (DMZ, por sus siglas en inglés) de Vietnam te lleva desde Hue hasta el 17º paralelo con un guía experto. Deténgase en Dong Ha, la antigua sede de los marines de EE. UU. Fue utilizado durante la Guerra de Vietnam (estadounidense) contra el ejército de Vietnam del Norte, que violó el Acuerdo de Ginebra cuando construyó el Sendero Ho Chi Minh que permitía el transporte de tropas y suministros. Visite los túneles de Vinh Moc y conozca algunas de las batallas más feroces en Khe Sanh, Con Tien, Hamburger Hill y más. Ver un aeródromo y una base de combate utilizados durante la Guerra de Vietnam. Our tour of the Vietnam DMZ was a fascinating and emotional day for me. Our tour guide, Hai, was fantastic. Her English-speaking skills were exceptional and her knowledge of the area was vast. She told interesting stories about each of the places we visited. My interest in seeing this and learning more was rooted in my own history as a student during the days of the Vietnam war. Hai was able to make the history of that time come alive with all that she told us. We saw areas where the war was fought and learned that the DMZ was actually the most militarized area of the war. We learned about the effects of Napalm and Agent Orange that continue to impact the lives of the people today. Seeing the former U.S. Marine base at Khe Sahn was especially interesting because we were there 50 years after the brutal battle that took place there, starting just before the 1968 Tet Offensive. 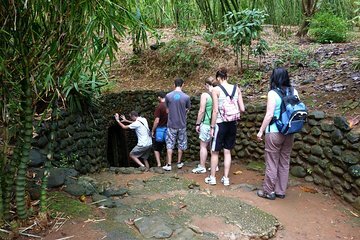 The tour of the Vinh Moc tunnels was so interesting to me because it was something I was unaware of and to learn of the people who lived in that tunnel system during the war was quite amazing. Hai did a wonderful job of telling the history of the Vietnamese people, both North and South, and I found it quite touching to realize all that they have lived through for so many years. Hearing all that she told us touched me deeply as I was reminded how lives were impacted no matter what side of that conflict people were on. If you have an interest in the history of the American War in Vietnam, this tour is a must. Hai's insights will stay with me for years to come. I give this tour my highest recommendation! Tam our guide was very knowledgeable about the significance of the sites visited. He was a child during the conflict so was able to give personal insights into the War and its affects on the local people. He has been a guide for a long time so was able to discuss the views of veterans on all sides of the conflict. This is the best way to get a well informed understanding of the War and previous conflicts in the area. It was an excellent tour to obtain knowledge of Vietnam's history.